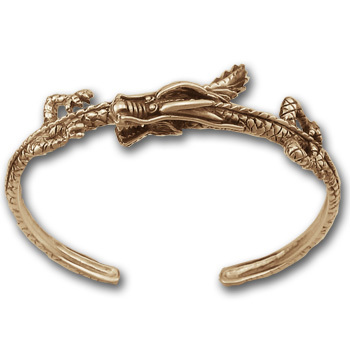 Slip this solid 14k Gold Dragon Bracelet over your wrist and you've got double Dragons on duty. The stunning detail from Wildthings Jewelry© brings these Dragons to life as they watch every move from two views. 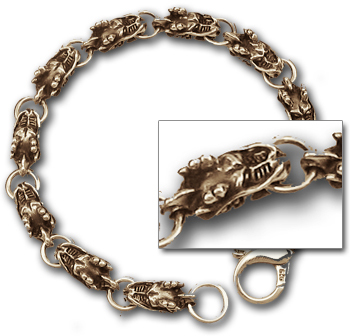 Both Dragon bodies wind around your wrist into the bangle in true scaly texture and ribbed spines. Heads have open mouths and horns, and each side has opposing four-toed legs with detailed claw. 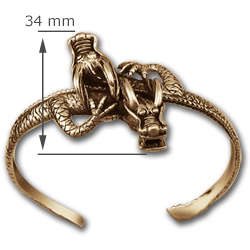 Dragons measure 34mm across at widest point. Also available in Sterling Silver.